Pictured are, from left, Melinda Spencley with the Emmet County Historical Commission; Griffin Landon, Hali Williams and teacher Sandy deCastro. Two fourth-graders from Pellston Elementary School won the 2013 Historical Essay Contest, hosted by the Emmet County Historical Commission. Both students are from Sandy deCastro's fourth-grade class. First-place was awarded to Hali Williams, 9. Hali won $100 from the Bob Schulze Fund for Creative Writing, a fund held at the Petoskey-Harbor Springs Area Community Foundation. Her essay is titled, "Olden days in Emmet County" and it relays an interview Hali had with her grandfather. Winning second-prize is Griffin Landon, 9. He won $50. His essay is titled "Fort Michilimackinac" and is about the historic fort in Mackinaw City. 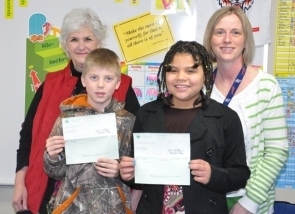 Their teacher won $50 from the fund to be used toward classroom supplies. Click on the PDFs below to read the winning entries. The contest is held annually by the Historical Commission. To learn more about it, click here.